Fish and birds are able to move in groups, without separating or colliding, due to a newly discovered dynamic: the followers interact with the wake left behind by the leaders. The finding offers new insights into animal locomotion and points to potential ways to harness energy from natural resources, such as rivers or wind. "Air or water flows naturally generated during flight or swimming can prevent collisions and separations, allowing even individuals with different flapping motions to travel together," explains Joel Newbolt, a doctoral candidate in New York University's Department of Physics and the lead author of the research, which appears in the Proceedings of the National Academy of Sciences. "Notably, this phenomenon allows slower followers to keep up with faster-flapping leaders by surfing on their wake." "While we currently use wind and water to help meet our energy needs, our work offers new ways to more efficiently leverage them as we seek new methods for enhancing sustainable practices," observes Leif Ristroph, one of the paper's co-authors and an assistant professor in NYU's Courant Institute of Mathematical Sciences. It's well known that animals such as fish and birds often travel in groups, but the details of these interactions in schools and flocks are not fully understood. 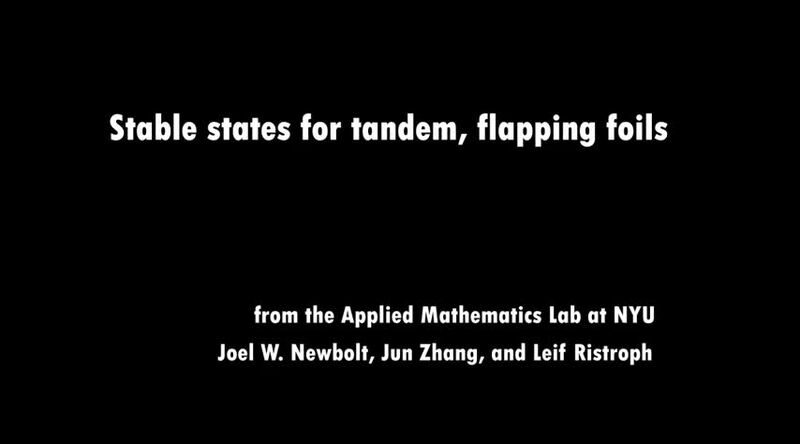 In order to study the effects of flapping motions and flow interactions on the movement of members in a group, the researchers conducted a series of experiments in the Courant Institute's Applied Math Lab. Here, they designed a robotic "school" of two hydrofoils, which simulate wings and fins, that flap up and down and swim forward. The flapping motion of each foil was driven by a motor, while the forward swimming motions were free and result from the pressure of the water on the foils as they flap. 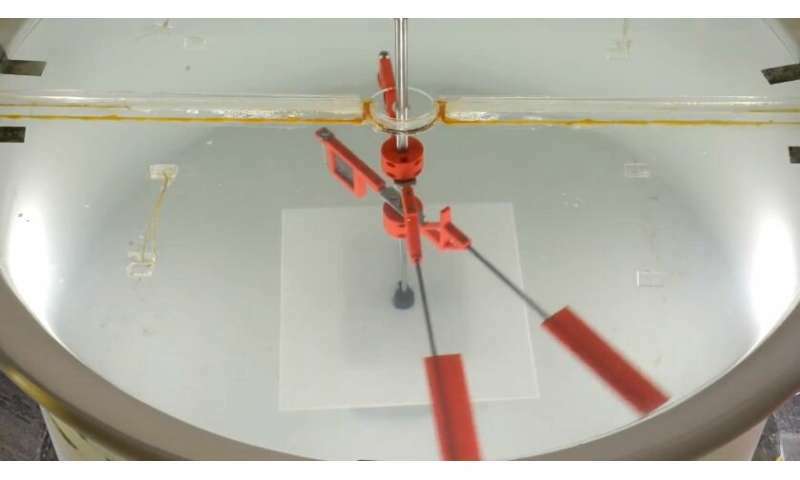 The researchers, who also included Jun Zhang, a professor at the Courant Institute, NYU's Department of Physics, and NYU Shanghai, varied the speed of the flapping motions to represent faster and slower swimmers and fliers. Specifically, the follower "surfs" in distinct ways on the wake left by the leader. If trailing behind, the follower experiences a "push" forward by this wake; if moving too fast, however, a follower is "repelled" by the leader's wake. "These mechanisms create a few 'sweet spots' for a follower when sitting behind a leader," observes Zhang. Sounds like resonance. Reminds me of the synchronizing metronomes.